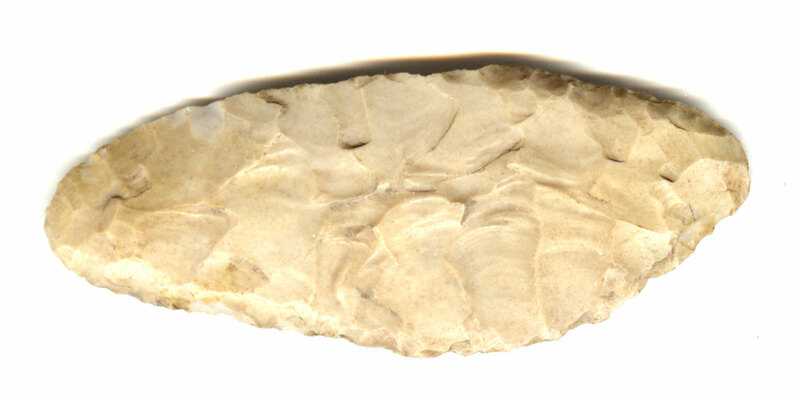 A Medium To Large Size, Thin, Visibly Aged And Anciently Used, Paleo Knife That Exhibits Surface Aging Coloration And Overall Stone Patination, Aged Use Polished Blade Hinges, Correct Ancient Blade Edge Pressure Flaking Use, Correct Early Percussion Style Blade Flaking, Overall Visible Ancient Use Wear, Correct Material And Manufacture For The Area Found. Ex-Terry Allen & Dennis Smith Collections. This Is An Excellent, Paleo Period Knife, Displaying Age And Ancient Use Wear! Includes A Ken Partain Certificate Of Authenticity!